Candidates for the upcoming Lok Sabha polls in India are coming up with innovative ways to campaign and this candidate from Chennai took his campaign a step further by filing his nominations in a 'noteworthy' fashion. Kuppalji Devadoss, an independent candidate from Amma Makkal National Party (AMNP) on Monday came with utensils of various shapes and sizes filled with currency coins totalling the Rs. 25,000 required as election security deposit. The total amount of the deposit was made up of coins Rs. 10, Rs. 5, Rs. 2 and Rs. 1 rupee denomination. 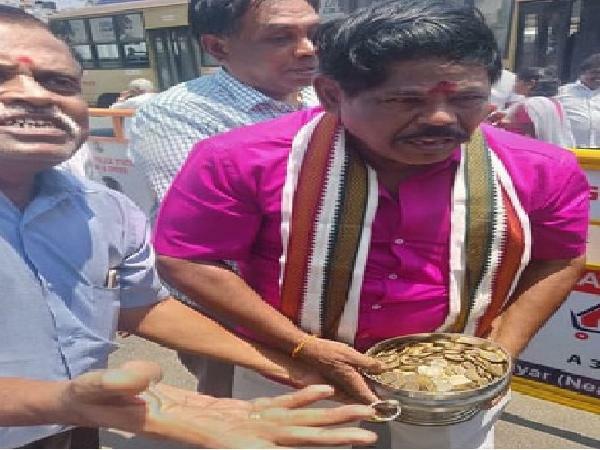 Mr Devadoss arrived at South Chennai zonal office 13 with the vessels filled with coins that he submitted along with his nomination to contest from South Chennai Lok Sabha seat, which is currently held by AIADMK's T Radhakrishnan. Tamil Nadu will go to polls on April 18 for its 39 parliamentary constituencies, while counting of votes will take place on May 23.